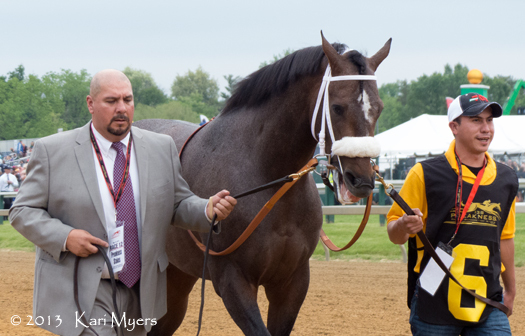 May 17, 2013: Fiftyshadesofhay on her way to be saddled for the Black-Eyed Susan. Hay! 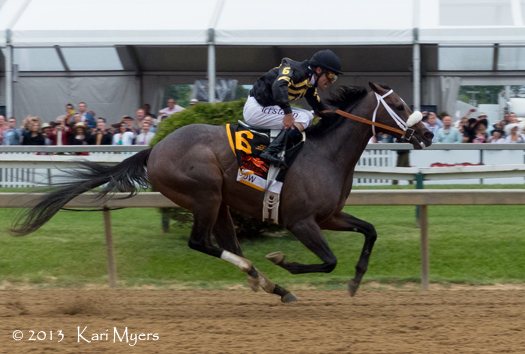 Fiftyshadesofhay won the Grade 2 Black-Eyed Susan on Friday, May 17th at Pimlico for trainer Bob Baffert. 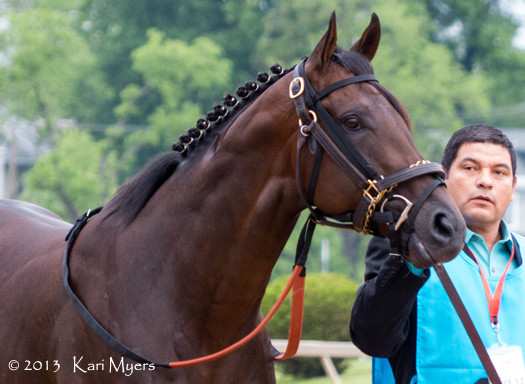 This beautiful daughter of Pulpit closed well under Joel Rosario to catch Marathon Lady in the stretch. 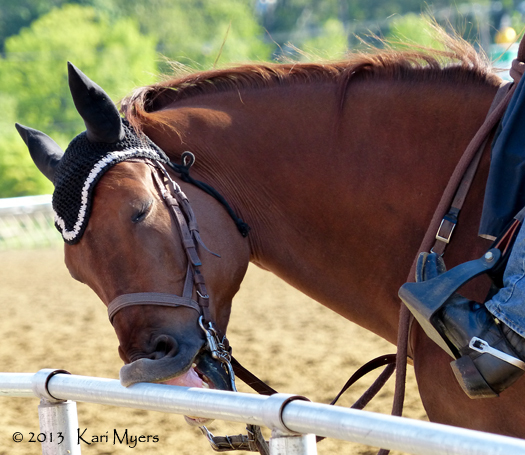 West Point Thoroughbreds’ Toasting was just back in 3rd. And yes, she’s named after the E. L. James books. I’ve never read them, but her name tends to get a giggle or two out of people who hear it for the first time. 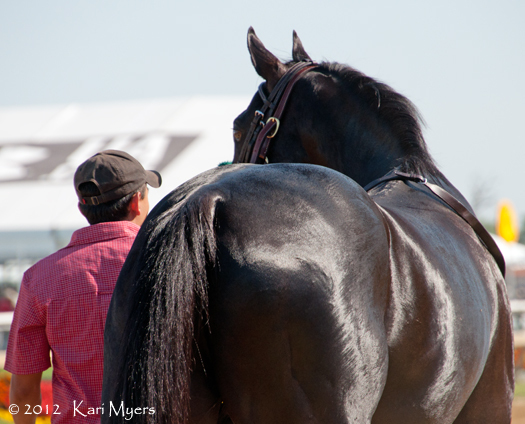 May 17, 2013: Fiftyshadesofhay walks serenely past the crowds at Pimlico. 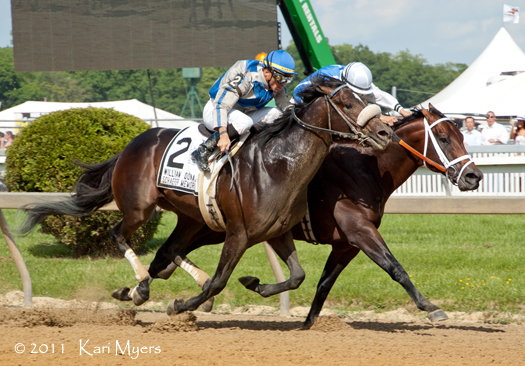 May 17, 2013: Fiftyshadesofhay, with Toasting on her heels, takes off in the stretch to catch Marathon Lady in the Black-Eyed Susan. 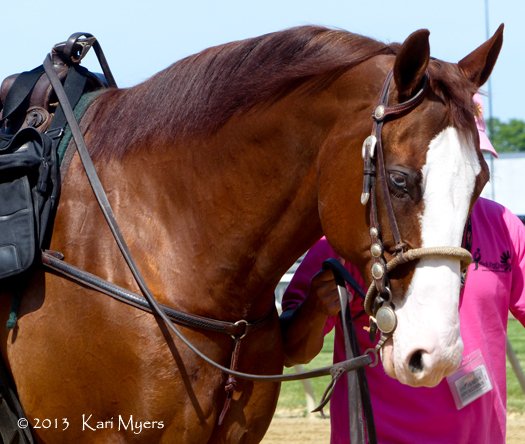 May 19, 2012: Straight Story on his way to get saddled for the Grade 2 Dixie Stakes at Pimlico. 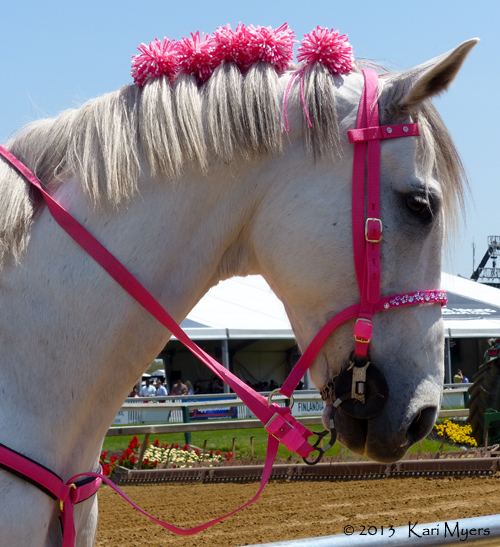 Every horse is beautiful in its own way, but a few really stand out from the crowd. Straight Story is the perfect example of a stallion that grabs your attention right away, and I thought I’d point him out since yesterday was his 7th birthday. 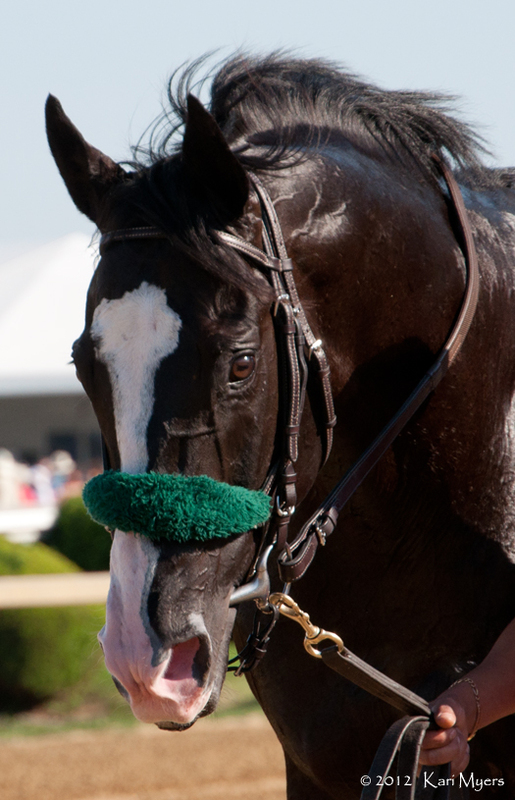 He’s a stunning son of Giant’s Causeway out of the mare Eventail–I just love her name!–who was a stakes winner herself. Eventail is a half-sister to Take Charge Lady, a multiple Grade 1-winning mare who has produced the recent stakes winners Take Charge Indy and Will Take Charge. Straight Story won a few graded stakes on the turf during his career, which was cut short on July 1, 2012 when he was pulled up with a leg injury in the Dominion Day Stakes at Woodbine. 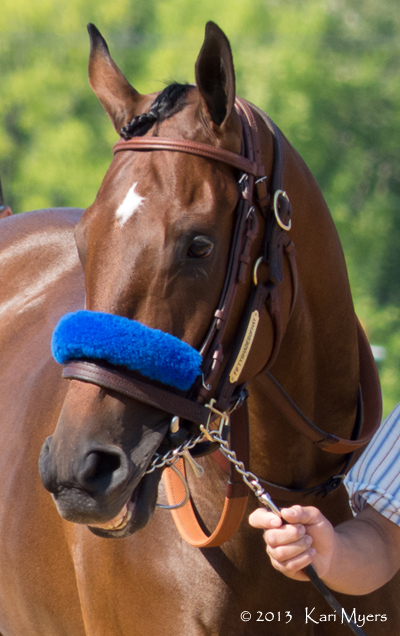 Update: Sadly, Straight Story was euthanized due to complications from laminitis that set in after his injury. Such an utter heartbreak to hear this news, and my condolences to his connections. 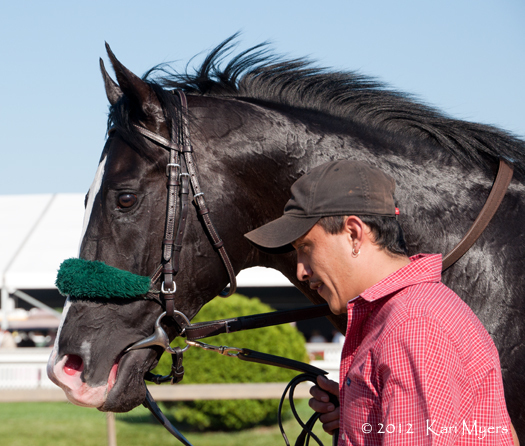 May 19, 2012: Straight Story heads back to the barn after a 7th place finish in the Dixie Stakes at Pimlico. 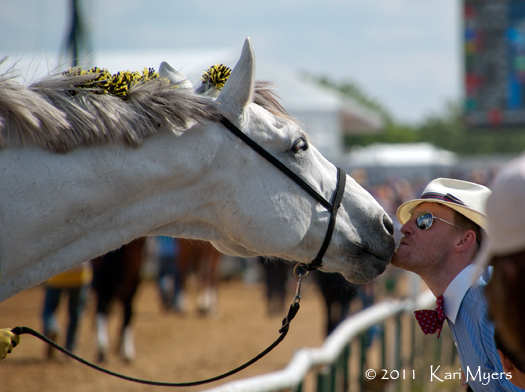 May 19, 2012: Straight Story again, because I just can’t get enough of this guy. 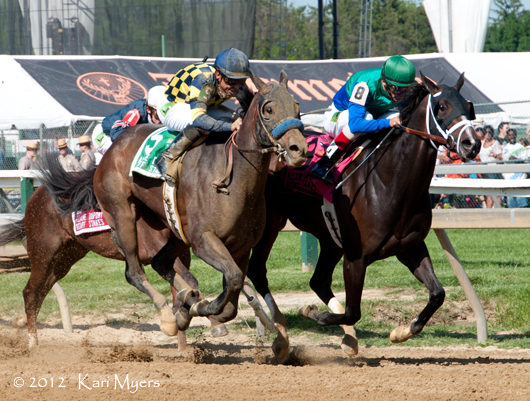 May 19, 2012: Awesomemundo (outside) runs down Love and Pride in the stretch of the Allaire DuPont Distaff Stakes at Pimlico. 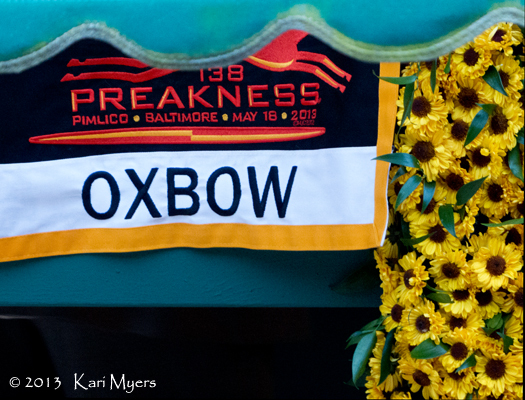 Several contentious races were run on the undercard of the 2012 Preakness. 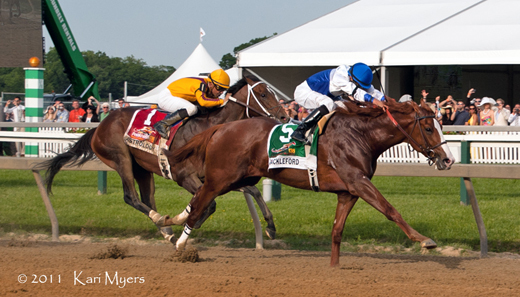 One of my favorites was the Grade 3 Allaire DuPont Distaff Stakes, which turned out to be a showdown between two very talented fillies. 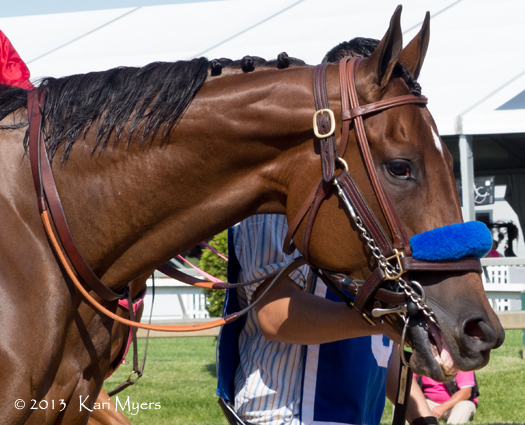 In the end, Awesomemundo beat Love and Pride by a hard-fought head in her first try against stakes company. As the picture indicates, a very dirty Awesomemundo had to come from behind to run down a nice, clean Love and Pride. 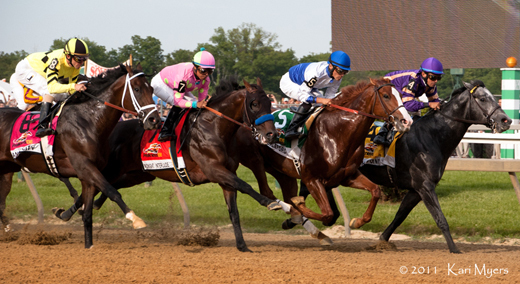 The field also included stakes winners Absinthe Minded, Strike the Moon, Catch a Thief, Check Point, and Daring Reality. 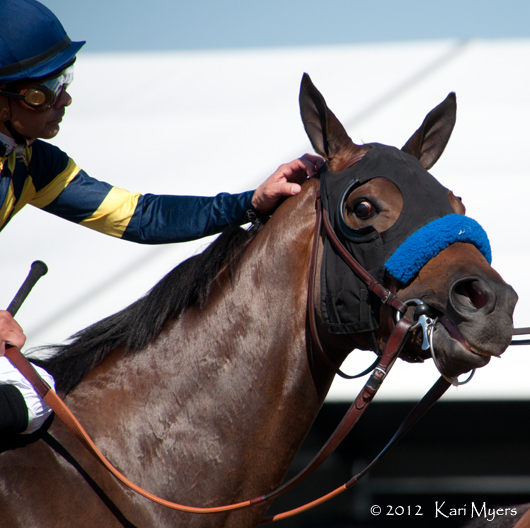 May 19, 2012: Awesomemundo gets a pat from Mike Smith just before the start of the Allaire DuPont Distaff Stakes. She’s got the most adorable face! 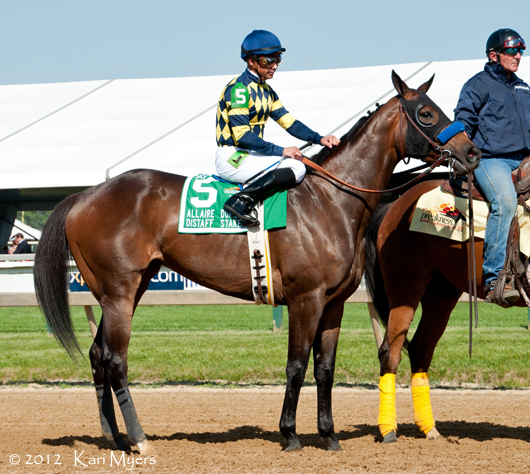 May 19, 2012: Awesomemundo heads into the gate for the Allaire DuPont Distaff Stakes at Pimlico. Love and Pride went on to win two Grade 1 races, a Grade 3, and finished out her year with a 5th in the Breeders’ Cup Ladies Classic behind Royal Delta. 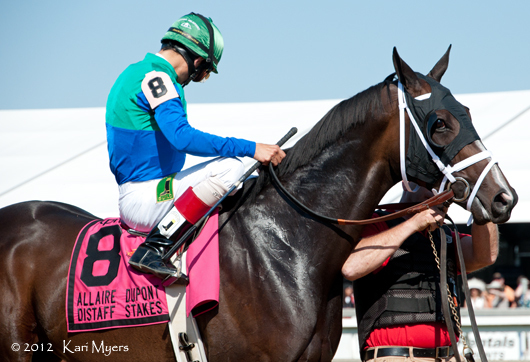 It’s of note that Love and Pride’s dam, Ile de France, is a half-sister to popular (and expensive) sire Bernardini. She’s got a pedigree to die for and will be five years old in 2013, so I’m pretty interested to see if she keeps running or is retired and sold for gobs and gobs of money. 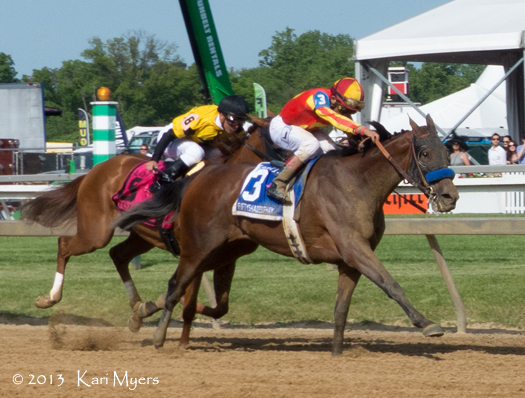 May 19, 2012: Love and Pride is lead into the gate for the Allaire DuPont Distaff Stakes at Pimlico. Awesomemundo is by one of my favorite stallions, Awesome Again, who was very successful on the track and has carried that success into the breeding shed. Her dam, One Fine Shweetie, was also a stakes winner, as is one of her sisters, which is why I was slightly surprised to see her RNA at the Fasig-Tipton November sale at $245,000 (RNA means the reserve price was not achieved and the horse was not sold). 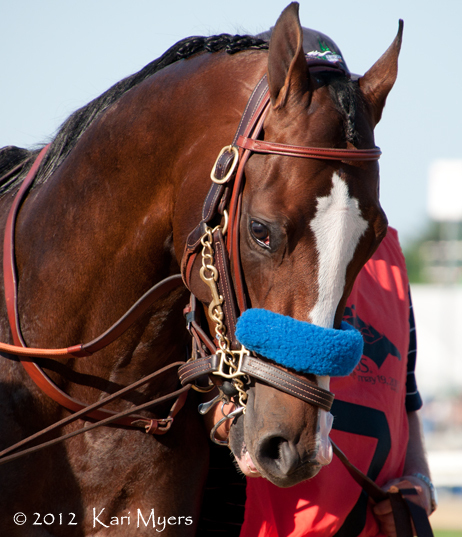 Awesomemundo is now retired, but she was trained in all eight of her starts by Bob Baffert and owned by his wife, Jill. 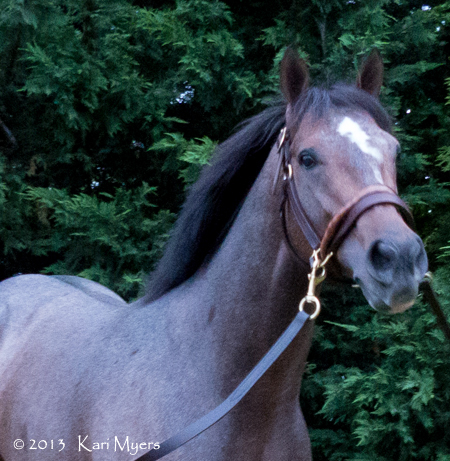 It looks like they’re going to use one of their seasons and are sending her to Bodemeister in 2013. Should be one beautiful baby! 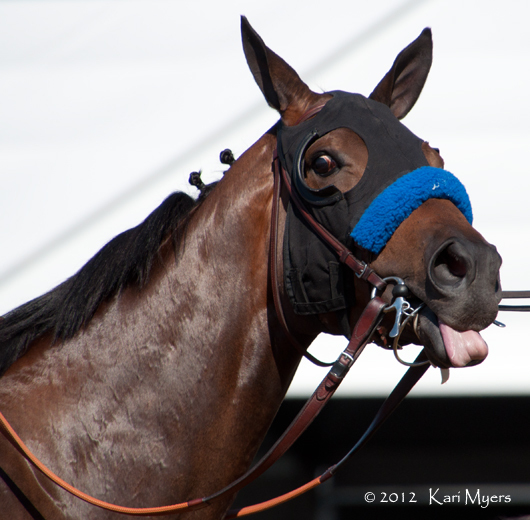 May 19, 2012: Awesomemundo lets everyone know what she thinks of her competition’s chances.